Friday night we undertook to make dinner for some Italian friends. I am still a bit nervous about making Italian food for Italians, so we built a “Mediterranean Menu,” incorporating preparations from Sicily and the Middle East, with a left turn to France for dessert. It turned into THE GREAT GARLIC DINNER: with the exception of dessert, there was garlic in every course. I had not planned the menu to be so. Only in the implementation did I realize how much the little wonders were incorporated. Luckily each person was a garlic fiend. 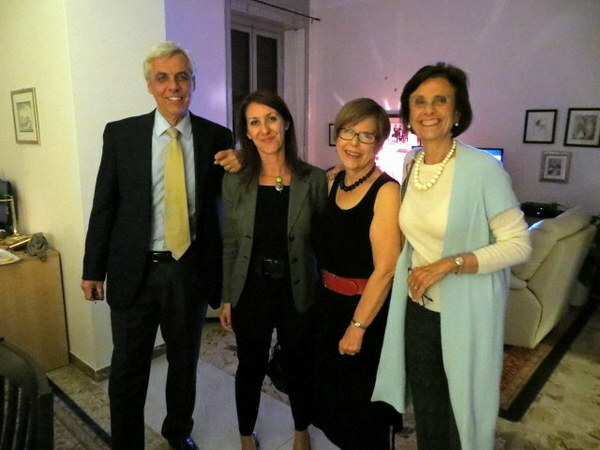 Gigi, Eleonora, me and Emanuela. Why do I always forget to take pictures of the food? We started with pancetta-wrapped garlic, which must be tried to be believed. Our guests had never seen garlic nor pancetta treated this way. Even our vegetarian guest downed several of the savory cloves. Of course olives were present, also in a garlicky/spicy treatment. Antipasti included balsamic-roasted red-peppers, hummus, and Ric’s very wonderful Sicilian caponata, also with an adequate amount of the pungent bulbs. Served with hot, crispy-crusted-tender-inside focaccia we probably could have quit eating at this point. Ma è non finisce qui! (But wait, there’s more!) The garlic-fest continued with garlic-crusted rombo and rosemary potatoes with olives and – you guessed it – garlic! 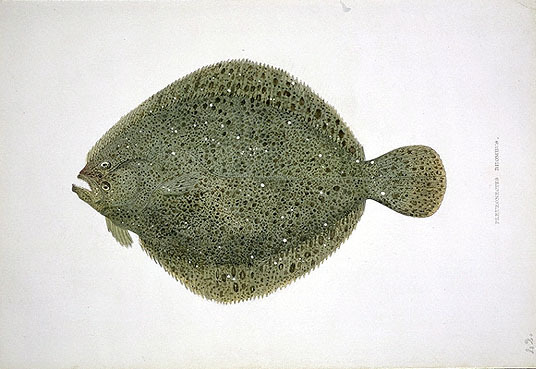 The rombo is a type of flat-fish, a member of the turbot family. I used to make this recipe with halibut in Portland. In fact it is a recipe our son taught me. Although Italian has a word for halibut, ippoglosso, you cannot get the fish fresh. So I asked at the pescheria what type of fish might work as a substitute and the rombo was the considered decision. I was quite flattered at the fish shop to be asked how I would prepare scallops. There was another customer there contemplating scallops as they were on special and according to the fishmonger Italians only have one way of making them: baked with breadcrumbs, a sort of Coquilles St. Jacques. He knew an American (between my accent and my marginal Italian it’s easy to tell that I am) would have other preparations so we had quite a 3-way conversation about pan-frying, in cream-sauce with mushrooms, stir-fried in an Asian style, etc. This is constant conversation in Italy wherever food is sold: How are you going to prepare that? Everyone has an idea and the exchange is quite interesting and informative. I am glad my Italian is now at a level where I can participate. But I digress…. The fish is spread with roasted garlic, then sprinkled with herb-seasoned panko, and broiled for a very few minutes. Yum! The potato recipe came from my friend Heather’s aunt, and is a real winner, perfect with this fish. New potatoes, two kinds of chopped olives, roasted garlic, herbs and olive oil = fantastic! No ketchup required. We finished the evening with a very French pots di crème served with fresh whipped cream,the intense chocolate being a fine counter-point to the savory dinner. At the very elegant Villa Taverna gardens. I was so wrapped up in the auction, wine and food that I forgot to take pictures. This was the cake-topper. Of course that was only Friday. 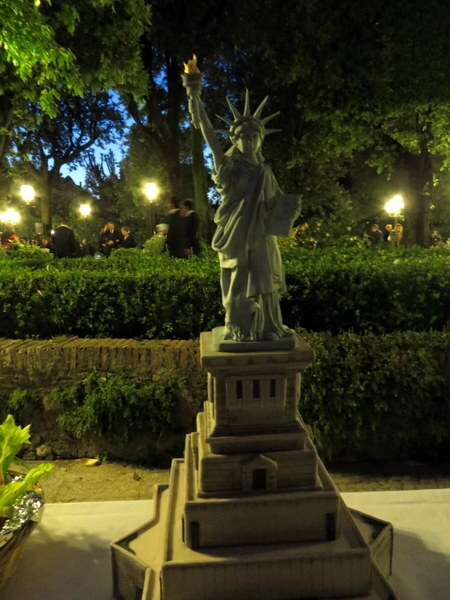 The gastro-fest continued at the annual embassy auction at the ambassador’s residence, Villa Taverna. Because U.S. government procurement law does not allow taxpayer money to be spent on employee functions, each year the Community Liaison Office holds an auction to raise funds to allow a couple of parties for staff, morale-boosting efforts for the Marine Security Guard, such as visits by their parents, and so on. The auction is a big deal, with great food and an opportunity to spend money. So of course we did. It looks like we have a couple of weekend trips ahead, including 3 nights at an agriturismo in the Brunello di Montalcino region. Ric and me in our little risciò, perfect for touring the park. V.B. is the largest public park in Rome. Sunday we decided it was finally time to rent a risciò in Villa Borghese. A risciò is a pedal-cart for two-to-four adults and two little ones. It is power-assisted so you don’t kill yourself pedaling, but it does take some thigh power to get around. We have a mind to take our young great-nephew and great-niece for an outing when they are here in August, so we thought a trial run would be a good idea. What a fun way to see the park! We walk through V.B. almost daily, but there are parts of the park we never get to see. So Susan and John, when you two are off seeing the Vatican Museums, we may be cycling your kids through the park. Anyone who knows Ric knows that pizza is a weekly menu item, usually on Friday night. Since we had company Friday and the auction Saturday, we had to push pizza to Sunday night, so very shortly we’ll be off our local pizzeria to feed the need. Great way to wrap up the weekend! 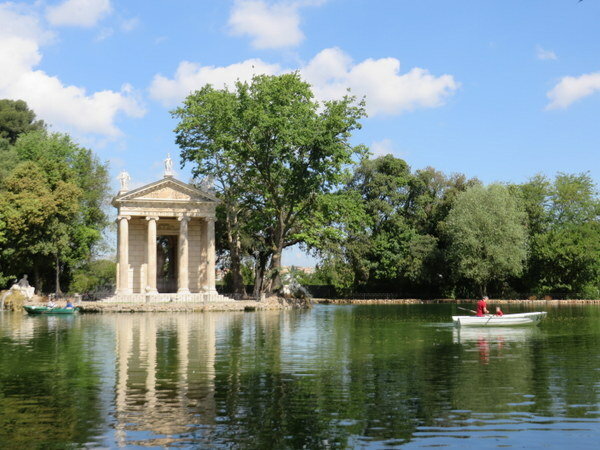 The lake in Villa Borghese. Very small, but quite sweet. Hope you all had fun this weekend too! YUM! 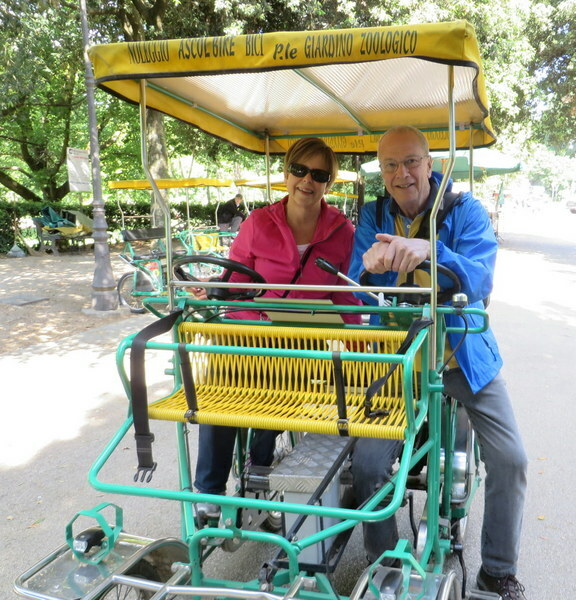 My mouth was watering too… I suspect your great-nephew and great-niece will *love* pedaling around Villa Borghese with you two! And have fun on the weekend trips… as if you need any further encouragement to do so ; ). Thanks Susan! Can’t wait to show you guys around and share our annual trip to the Dolomites! My mouth was watering just reading your menu and how good everything really was. I don’t cook really but anything simple so doing this for Italians would just have stressed me to no end. GREAT story! Grazie Marcia. If only I could remember to take pictures of the food! Neither do all Italians cook, but I think they are all born to appreciate really good food. Even the children have pretty sophisticated tastes. Oui! Forgot how beautiful and captivating this city is! SO happy you are going to Montalcino and Montepulciano….that’s where we went when we stayed at the villa in Cortona about 5 years back. Our friend set up personal wine tours and visits with the winemakers at a few places. Let me know if you need any info…..you will LOVE it! And I would love the garlic wrapped in pancetta, fish with garlic and potato recipes if you have a chance. Thanks, Laurel! Polly you are so welcome. Hope to hear some details so we can add your knowledge to ours for our next trip to the area. Yum!!! If there are any recipes that are willing to be shared, I’d put my hand up! Sounds like a wonderful time….love how you experiment! I always share recipes. Goodness must be shared! Just tell me which ones. Are you in Paris now? Thanks T! Got the details yesterday: 3 nights near Montalcino and 2 near Montepulciano. Wine trip ahead! All I have to say is “how about pizza” and the smile spreads across his face!